Underneath the counter at Bookworms' Exchange, proprietor Bev Brown keeps two old-fashioned card files: one crammed with the names of active customers who have earned store credit by selling their used books, and another with the names of those who no longer seem likely to cash in their credit. The overstuffed condition of the files is a testament to the decades Brown's used bookstore has been a local fixture, during which time she's amassed a long list of loyal customers. As of next month, though, any uncashed store credit will go the way of the South Burlington store's remaining stock of used books. Brown, who turned 79 on November 25, is retiring and will close up her shop — one of a dwindling number of independent bookstores in Chittenden County. "My husband has been after me to retire for years," she says with a smile. "But I've been having too much fun." Offering a reporter a comfy green rocking chair in the middle of the store, Brown explains that her age, coupled with a slowdown in sales, pointed unambiguously toward retirement. Her only regret? She wishes she'd started in the used-book business a little earlier in life. SEVEN DAYS: How long has Bookworms' been around? BEV BROWN: Thirty-one years. Seventeen years in this location. Before that, 12 years on the corner of Brewer Parkway and Shelburne Road; before that, in a place out near where Charlie's Tennis Den used to be. A few old people will remember that one. SD: So you started up the shop relatively late in life? BB: Right — I didn't start this business until my mid to late forties. Before that, I was a stay-at-home mom, and also worked part-time in a lingerie store on Church Street. SD: What's been your favorite thing about owning and operating this shop? BB: The people, the customers. Valerie [gesturing toward a customer] has been a customer since 1986. I have a lot of those. I have people from '83 who still come in regularly. BB: I haven't really ever gotten around to the figures, but I'd say that my business has dropped by 10 to 20 percent every year for the last three or four years. Other used-book dealers have been struggling, too, but many of them have been willing to find other sources of funds — selling online, that sort of stuff. But I wasn't interested in learning any of that. I didn't want the hassle. SD: Indie bookstores have been struggling for a while now. What are some of the strategies you developed over the years to remain in business? BB: Oh, a lot of different things. I was sort of the middleman for a textbook company in New Hampshire, but that turned out to be quite complicated, because I had to set aside my own bookstore to do it. I also used to rent hardcover bestsellers. That worked out well. I'd buy them new, rent them until they came out in paperback, and then get rid of them. Then I rented books on cassette, and then that changed into CDs, so I had to replenish my whole stock. SD: What sorts of readership trends have you noticed over the years? BB: When I started, I sold an awful lot of romances. I sell more mysteries now, and general fiction. I certainly still sell romances, but they're not the main thrust now. I've also seen that, when a popular author writes a new book, there's a call for his or her older books. SD: Speaking of changing technology, how do you think the popularity of e-readers has affected independent bookstores? BB: I'd say that e-readers are most definitely the major reason that many stores have closed. Bookworms' Exchange, at 1525 Shelburne Road in South Burlington, will close on Saturday, December 13. 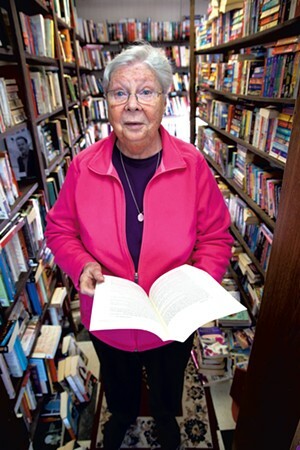 The original print version of this article was headlined "A Beloved South Burlington Book Shop Turns the Last Page"